Your wedding banquet is going to be so amazing! Usually amazing costs a lot of money and really, your money is better spent on starting your new life together. So, here is an idea that will let you budget your money elsewhere and still put on an incredible celebration of your vows. By shifting the wedding banquet from evening to the daytime, you will save a lot of money. An early reception might save money on the social hall, given they can still rent the hall after your event. But beyond the social hall where the reception is held, you’ll save money on the caterer, liquor and entertainment, too. Every step of the way there is savings. The caterer might be able to do another event after yours, but more importantly you’ll have a lighter meal. Luncheons are not as elaborate as dinners. They are quicker without so many courses, possibly just a soup and entrée followed by an array of small desserts. The entertainment is where things get creative. Dancing is not expected in the middle of the day, so light music playing is perfect. You can have a string quartet for the entire reception for music. Even streaming music is acceptable. But you’ll need to have fun, memorable things to do in place of dancing. One of those fun things of late are photo booths and wedding books. There are services that will show up with a photo booth to take costumed photos of the guests one or two at a time. The guests get to keep a video or a keepsake book of the images. But, for luncheon wedding banquets, sometimes people just want to enjoy each other’s company and sit and chat without any wild activities, especially if the guest list is smaller than 75 family members and friends. 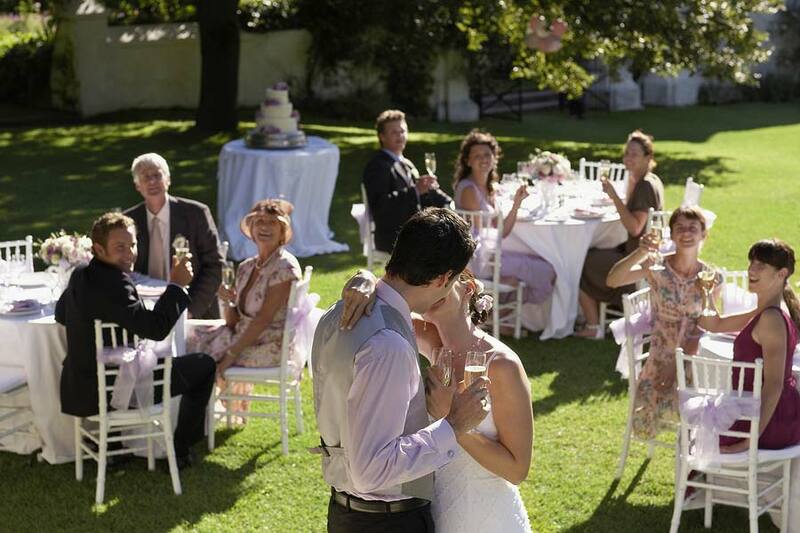 Wedding banquets done as luncheons are intimate, fun and an easy way to reduce the wedding budget. Spend the savings on a down payment on a house. Very nice guide! this will make any wedding much more special. Very great points! Thank you so much for sharing. Definitely important to be sure you save as much as possible! Hello, your blog is really nice. Thank you for sharing these unique points to make your wedding banquet a beautiful Romantic money saver. Keep posting!